When Player #1 calls the "3" play, Player #3 makes a V-cut back out to the extended free throw line looking for the pass from #1. At the same time, Player #5 slides up to the weak-side elbow. 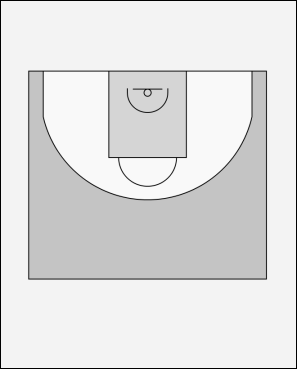 After passing the ball to #3, #1 sets a screen for Player #2. #2 makes a hard cut to the basket looking for the pass from #3 and to make a lay-up. If #2 does not receive the pass, he continues his cut to the weak-side baseline corner. Note: Should #1's defender move out on top of the screen, then #1 should slip the screen and cut to the basket looking for the feed from #3. Player #4 rolls up and replaces the #2 spot. When Player #2 cuts and does not receive the pass from Player #3, Player #5 then sets a backscreen for Player #1. #1 slips around the screen for the pass from #3 and the lay-up. If #1 does not receive the pass from #3, he will post up on the weak-side block. Should #1 not receive the pass from #3, then #5 should have inside position on the defender if he seals the defender correctly. If this happens, then he just rolls to the basket for the pass from #3 and the shot. If no pass is made to #5, then he rolls to the weak-side block and #1 slides to the weak-side baseline corner. If Player #3 is unable to pass to any of the cutters, the #3 can continue into the Triangle offense.